In Flack this week: PRWeek Running Club catches up at Ketchum, May's healthy hire, Space: the final frontier (in billable hours), a beefy bouquet and more. The second outing of the PRWeek Running Club was hosted at Ketchum’s office in Bankside 2 last night, with more than 20 industry runners in attendance, taking in a 40-minute out-and-back route along the Thames, before returning to HQ for some refreshments. Thanks to account director Karl O'Doherty for organising, and to Ketchum itself. Official selfie taker (see below) was Ketchum chief engagement officer Stephen Waddington, who hailed the creation of the vets category - Flack assumes that this includes him and Omnicom PR Group international president David Gallagher, but surely not CIPR president Sarah Hall. Other agencies represented include Good Relations, MSL and Weber Shandwick, alongside in-house pros. Hotwire continued its strong presence with four runners in attendance, led (literally) by speedster UK MD Matt Cross. Email news editor Sam Burne James if you'd like to get on the mailing list for future runs - put Thursday 15 March in your diary - we'll be running from Good Relations' office. The club is designed to be fun, inclusive, and sociable, and outings take place on a midweek evening once a month. Flack admits to being slightly (well, a bit more than slightly) behind the curve on this detail about a junior ministerial appointment made last month, but thought readers might appreciate being brought up to speed. It turns out that there is a minister for the creative industries (no, Flack neither), and the new incumbent of this post is none other than Margot James, a name who will resonate with healthcare PR specialists - she co-founded the agency Shire Health in 1986, later selling it to WPP, and continuing to work with the merged entity for several years before becoming the Conservative MP for Stourbridge in 2010. Readers may recall that Lansons founder Tony Langham last week contacted Private Eye to request a correction, after the satirical mag alleged the agency had not lived up to a transparency promise made in a PRWeek article. "Apologies for incorrectly identifying Elevate as Innovate," the Eye said in a correction in this week’s edition - it had claimed that Lansons did not identify its work with the latter on its website, having confused it with the former. The Eye had also referred to Appleby, a law firm it says is trying to block further Paradise Papers revelation, as a Lansons client. "We are happy to point out that Lansons has never worked for Appleby. The article should have made clear that Lansons’ client is the International Financial Centres Forum, of which Appleby is a founding member," the mag concluded. Kudos to the Private Eye sub-editor who titled the segment 'Appleby turnover'. As the world watched in awe at what could be the PR stunt of the year – Elon Musk’s SpaceX company launching a 2008 Tesla Roadster into orbit – Flack couldn’t help but smile wryly at this observation from a comms copywriter from Down Under. "We want to do a stunt that gets the whole world talking, like the Tesla in space thing. Meat snack brand Peperami is - but of course! - running a Valentine's Day marketing campaign. The first element includes an experiential activation at Westfield Stratford City from today until Sunday (9-11 February). "Consumers will be able to meet the Beef Animal in person, where he will be on hand to offer romantic advice in his very own Love Grotto. 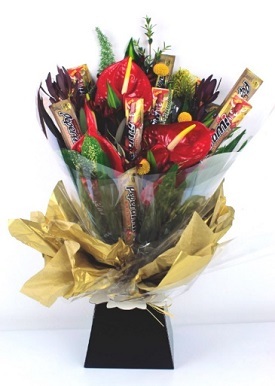 Interactive elements of the pop-up will give consumers a chance to win a range of Valentine’s Day-inspired gifts, including bespoke Beefy Bouquets," reads a press release from Spider PR. Sometimes, Flack reflects, a candelit dinner at Greggs just won't quite cut it. Finally, here's news about a company getting its staff to down tools early on a Thursday in order to go for a drink together. Nothing unusual you might think, plenty of PR agency staff will be very familiar with this routine. What is different here is that this isn't a 40-person creative shop in Shoreditch, but global drinks company Bacardi, whose 5,500 staff from across the world all did so last night to celebrate Founder's Day, the 156th anniversary of the company's creation on 4 February 1862. 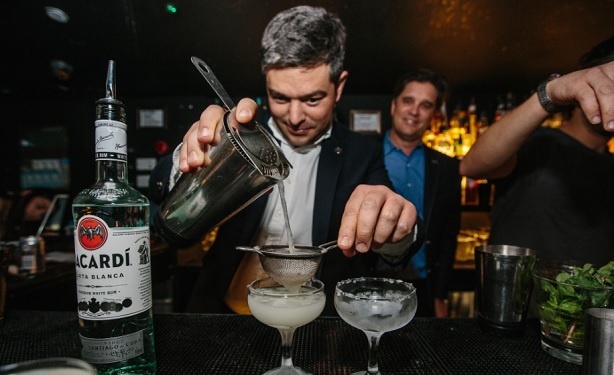 The campaign - yes, this is of course a marketing push, not just a jolly - included a visit to a bar in London by Bacardi's global brand ambassador Jacob Briars (below) and newly appointed chief marketing officer John Burke (behind Briars, in blue shirt).